World Streets: The Politics of Transport in Cities: Heritage and transport: And leadership by example? "We’ll keep our cars thank you very much. And we shall park them where we want. And for as long as we choose to. If heritage is a barrier, let’s move it out of the way. And, by the way, what moral authority do you have to tell me otherwise?" Climate Change is so serious explain the policy wonks that it is like a war. Did Gandhi then delay the salt march due to the searing heat of Gujarat? It took place when the Gujarat cauldron was heating, finishing in April 1930. Did Gandhi continue to take His Majesty’s coin as a lawyer as ‘the system was made to support the Empire and until it changed. We wouldn’t? This is a key point. Until policymakers start to take a lead and practice what they preach who will believe the product they are trying to sell? “The problems of excessive traffic are crowding in upon us with desperate urgency. Unless steps are taken, the motor vehicle will defeat its own utility and bring about a disastrous degradation of the surroundings for living... Either the utility of vehicles in town will decline rapidly, or the pleasantness and safety of surroundings will deteriorate catastrophically – in all probability both will happen." The prophetic words of Colin Buchanan in the UK 1963 “Traffic in Towns” Report are now ringing in the ears of Indian towns and cities. Drivers include; a high and fast growing urban population, rising levels of prosperity, inadequate public transit, sprawling cityscapes, and easy lines of credit. All are factors behind a growing appetite to raise status through motorcycles and cars and buy into the suburban dream waiting just round the corner. More on that at the end of the article! The impact of growing traffic is being felt specifically on built heritage in a number of important ways. The historic centres of Indian towns and cities were not designed for motorized traffic. Streets were meant to be narrow to offer shade for all manner of pedestrian and animal traffic to go about their business without struggling too much against the extreme heat of summer. Pick up any Lonely Planet to India and you’ll find testimony that such a heritage fabric lends itself for the tourist to enjoy on foot or by bicycle. Sadly exhortations to ‘explore the old city by cycle rickshaw’ or ‘hire a bicycle to enjoy the outskirts of the town’ are fading away as pollution, noise and danger render the option unpalatable. A perfect case in point is the system of nallahs or streams running through the city of Delhi. Built by the Tughluqs to supply the city with water nearly 1,000 years ago these nallahs or streams could be cleaned up to act as ‘greenway’ walking and cycling corridors. 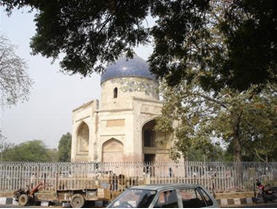 Just one nallah in South Delhi, for instance would link five of the seven ancient cities of Delhi, providing unrivalled access for tourists, school children, families to get in touch with the proud history of this city. Led by hungry contractors, the picture below shows what is happening in practice. Not only is tourist revenue under threat, but local people are increasingly hooted at and bullied in their own backyard by motorized transport. Parks and gardens are difficult for children and the elderly to get to. 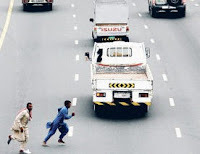 Street play is hazardous between parked vehicles and erratically moving traffic. What visual and aural intrusion is doing to deter tourists from ‘Incredible India’ is one thing, but the associated levels of pollution are also damaging building fabric. In larger towns with roads over 30 metres in width, high levels of traffic are also decreasing the economic viability of heritage buildings as they become dangerous and difficult to access – witness Sabz Burj on a traffic island in Delhi. On a wider level whole communities living in historic enclaves are severed by wide arterial roads cutting through their heart or surrounding them from outside. At a policy level there is a yawning gap between land use and transport planning. Delhi, the capital city of India still has no Transport Plan. A series of exhortations in the Master Plan to build cycle tracks on all arterial roads are rarely observed and, without any network plan, those that are remain ineffective. In the absence of any multimodal plan to reduce journey distance through the application of compact, mixed land use strategies, large numbers of people are moving to greenfield apartments that can only be reached by motorbike or car. The newly opened Gurgaon Expressway from Delhi, saturated with traffic years ahead of schedule, is the result. There are isolated examples of towns that have challenged the ‘inevitable’ threat to their heritage caused by unbridled suburbanization and motorization but only one has done this in a systematic way; linking environmental, social and economic objectives. Located near the India-Pakistan border, the Punjabi town of Fazilka removes cars from the city centre during daylight hours. The market area was the first part of town to be made car-free. Four-wheeled vehicles are not allowed to drive in this zone during 12 daytime hours, although even then it has not yet been possible to prohibit motorcycles successfully. The Municipal Council President Anil Sethi places an emphasis on improving local transport options rather than in encouraging long distance travel. Sethi eschews overpasses and flyovers in favor of initiatives like the ‘Eco-cab’ scheme where residents can use their mobile phones to dial a cycle rickshaw to take them door-to-door. The local tea seller or shopkeeper keeps part of the telephone fee for acting as the cab controller, directing rickshaws to their customers. 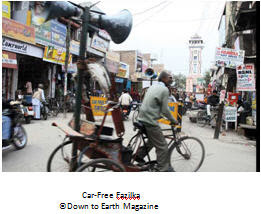 Other examples of towns applying the ‘car free’ concept, although not in a holistic way like Fazilka include Nainital, Shimla and Darjeeling where cars are banned during retail hours on the main shopping streets. The concept is an in emergency response to the huge influx of tourist traffic during the summer months. This, combined with steep hillside topography constrains the movement and storage of vehicles. In Nainital a system of Eco-Cabs operates where users obtain a ticket from a booth at either end of the main street and then travel from one side of the town to the other. Challenging gradients preclude cycles or cycle rickshaws in Shimla and Darjeeling but allow for pedestrians to enjoy unfettered access to the main shopping streets. 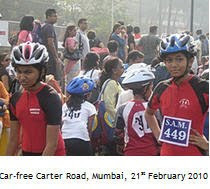 In a sign of things to come, the Carter Road in the Bandra area of Mumbai organized its first car-free day on 21st February 2010. Forty thousand local residents and Bollywood celebrities including Priya Dutt pledged to take part whilst the area was closed off to traffic. The aim of the event was to focus people’s attention on the impact of vehicles on pollution and in inhibiting healthy living and exposure to the great outdoors. Perhaps the key point to make, however, is that cars are aspirational. The policy wonks who rail against the Tata Nano would be the first to scream and cry if they were asked to make sacrifices by walking or cycling to the office or using public transit. Most have chauffer driven, A/C vehicles clogging up the roads on the way to their next conference. Go to the Habitat Centre in Delhi by cycle, home to a host of environmental and UN organizations and you will be politely waved through the service entrance and forced to face oncoming car traffic. Go to a conference by cycle and you will be waved away. When these leaders asked if they walk or cycle the inevitable answer is ‘No, it’s too dangerous.’, ‘When the roads are planned for cycles I will use one’, ‘ It’s too hot for 9 months of the year in India to cycle’. The answer is always why I can’t do something, not why I can. In fact it’s perfectly possible to cycle in the Indian Plains early in the morning or late in the day when most people commute even during the hotter months with a folded shirt in your bag, a hat on your head and a T-Shirt on your back. - Simon Bishop is working as a transport and environment consultant in Delhi, where he lives with his family. In India he has worked on bus and cycling projects like the Delhi BRTand helped set up the Global Transport Knowledge Partnership. Before coming to India two years ago Simon worked in London as a planner on demand management and travel marketing schemes, receiving an award from the Mayor for "London's Most Innovative Transport Project". He authored 'The Sky's the Limit' - Policies for Sustainable Aviation' while working as a policy adviser in the Institute for Public Policy Research. Mid-week recess: STOP right now!